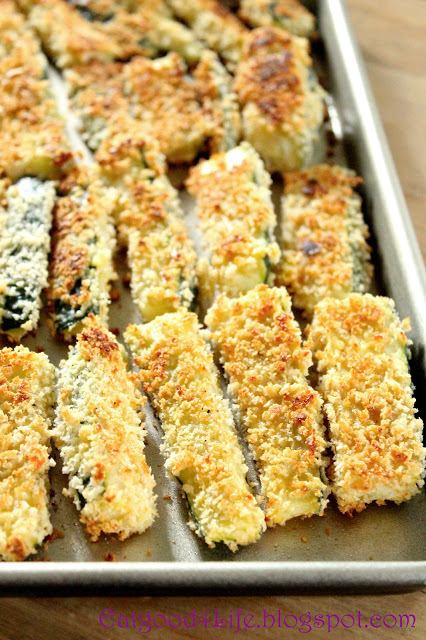 I am totally in love with these Chunky zucchini fries. 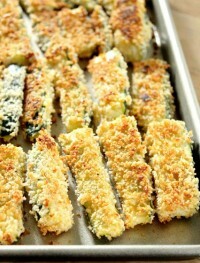 They are so easy, healthy, nutritious and tasty all in one. Chunky zucchini fries anyone? I just love these. They are so easy to make and so yummy!! These Chunky zucchini fries might be a bit messy to put them together with the dipping of the egg and panko breadcrumbs but nothing anyone can’t handle. 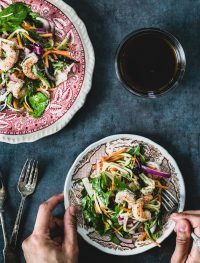 Super bowl is just around the corner and having something a little bit healthier among all of the starches, fried foods and drinks is not a bad idea. One thing I have noticed with these is that you must serve them right away, as time goes by the tend to get a bit soggy. They are still good but we do like them crunchy. Anyhow, I hope everyone has a great time at the super bowl, I know we will!! 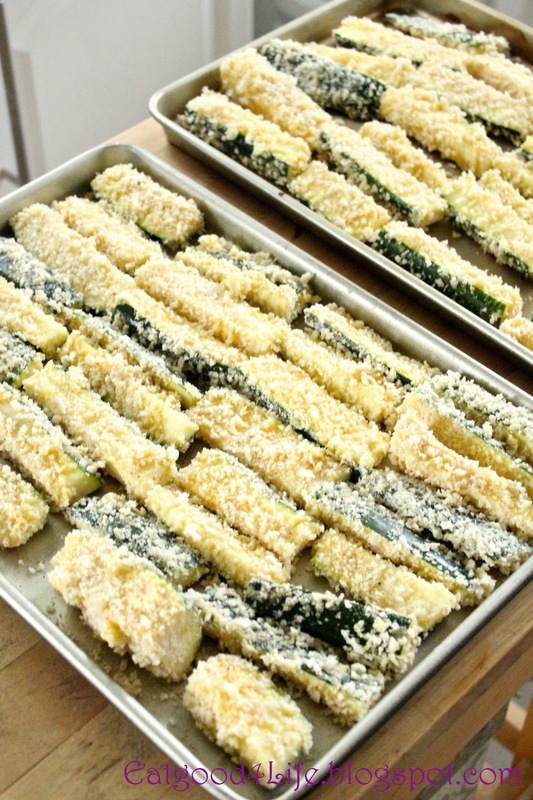 Arrange zucchini pieces among two baking trays and bake at 375 for 10-15 minutes. Turn each piece and bake another 10 minutes making sure they get golden brown all over. Serve with your favorite sauce. We do with sweet and sour chili sauce and organic ketchup for the kids. Preheat oven to 375F. Lightly spray some oil onto two baking sheets and set aside. On the mean time have two bowls out and place beaten eggs in one and panko breadcrumbs and spices in another. 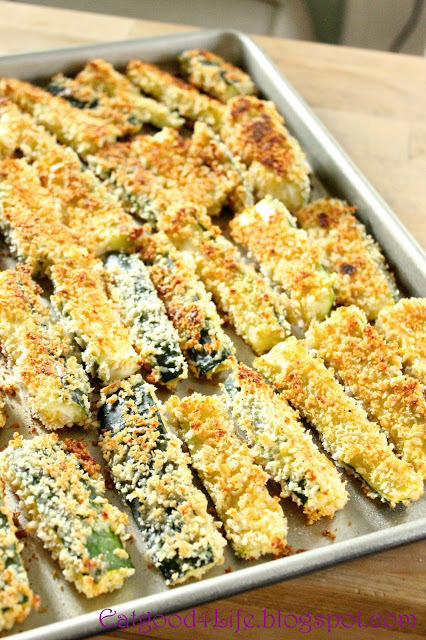 Dip zucchini pieces in the eggs followed by the panko breadcrumbs making sure you cover them with the eggs and panko through all sides. I do this step twice, egg, panko, egg and panko again. Bake zucchini for 10-15 minutes, then turn each piece onto the other side and bake further another 10-15 minutes or until golden brown. NOTE: If your panko breadcrumbs are too large you can place them in the food processor to make them finer. Additionally, you can season panko breadcrumbs with dried spices. Any of your choice will work! I love low calories, nutritious yet delicious dishes like this!!! I love love that your simple salad are so full of flavor. 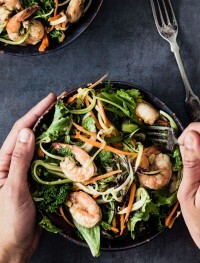 We love shrimp and such a nice addition to a kale salad. Yum. I am also going to make your macaroni from the last post. Looks amazing. Wow I love all the ingredients in this salad. So many wonderful flavors and so good for you too! Hello lunch for the week! Looks amazing! This sounds divine and like the perfect meal for me when the husband is traveling. Can’t wait to try it! 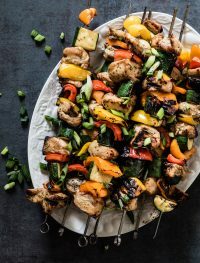 This looks so fresh and healthy–perfect for summer! I cannot wait to try it! This salad is GORGEOUS! 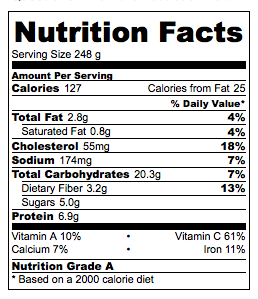 Love the addition of delicious shrimp. I love all the ingredients you used in this salad! Looks so flavorful!